I can't walk into Target without stopping at the dollar bins. I found these bottle cap coasters a few weeks ago and grabbed several packages (I think there were 6 in a package for $3.00) I wasn't sure what I was going to do with them, but I bought them anyway. I decided to turn them into magnets. A little paint, a piece of scrapbook paper, a photo, some washi tape and magnets and I had myself an adorable new magnet. The last photo shows the comparison with a typical sized bottle cap...these things are big! 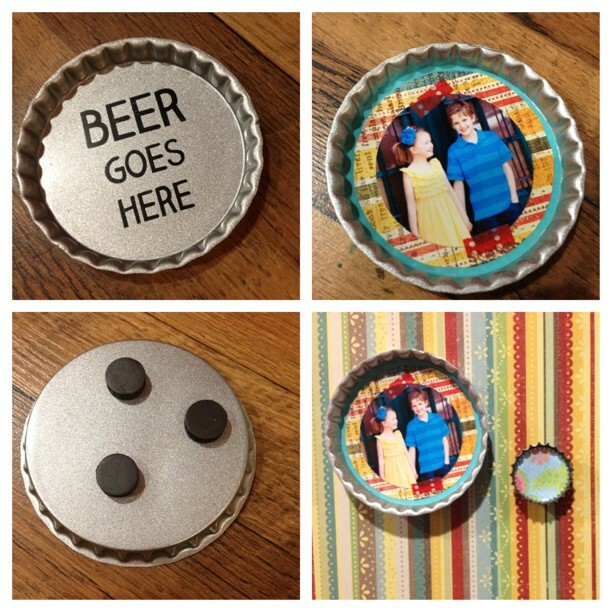 The possibilities for these lovely "coasters" are endless. I suppose you could actually use them as a tacky place to rest your beer, but why would you want to do that? I think I'm going to try making a wind chime with them next. I'll let you know how that goes.